The Demag AC 500-8s at Riyadh Metro. 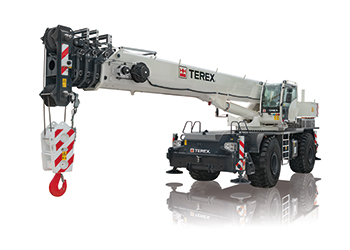 Terex Cranes has disclosed several launches this year especially targeted at the GCC markets. Of these, the RT 90 best suits the region in terms of capacity, functionality and design. Terex Cranes is poised to launch a number of its latest innovations on the regional market over the next few months, having recently delivered a new 90-tonne rough-terrain (RT) crane in Saudi Arabia. The new 90-tonne model, the RT 90 – sold to a customer in the kingdom – is a pilot model which will be under close scrutiny by the leading crane manufacturer to ensure its optimal performance given the harsh conditions that it will be subjected to in the Gulf region. Speaking exclusively to Gulf Construction, Carsten von des Geest, vice-president, sales and service EMEAR (Europe, Middle East, Africa and Russia) for Terex Cranes, says the RT 90 is well suited for the Gulf both in terms of capacity, functionality and design. The Terex RT 90 features an enhanced control system with integrated diagnostics, a redesigned cab with an 18-degree tilt and an easy access flat deck for improved visibility. The five-section, full hydraulic boom of the RT 90 stretches 47 m for long-reach applications, and the unit’s multi-stage outriggers are designed for a variety of outrigger positions. Transporting and operating costs are reduced due to the RT 90’s narrow width of 3 m and central lubrication system. In 2018, Terex Cranes will also start delivering its two new three-axle all-terrain models – the Demag AC 55-3 and AC 60-3. Von des Geest himself has been with Terex Cranes for over 12 years, starting as a sales manager within its international operations. Between 2007-2011, he was based in Dubai, UAE, leading sales in the Middle East. He then served as director of sales and service for China and southeast Asia, before taking on the mantle as vice-president, sales and service for the entire region, where he provides the local team with all the necessary support in terms of ensuring they are well equipped with the resources to drive business as well as providing assistance with projects and contacts, given his experience in the region. “Because of my long and positive experience in the region, I have a strong connection with our local operations and our customer base in the region,” he explains. 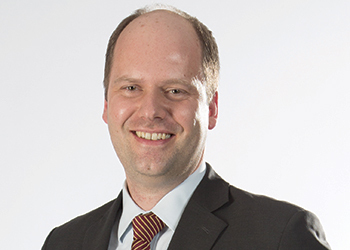 Now based in Switzerland, Von des Geest is spearheading a strong and committed team of sales and support staff stationed at its regional office – Terex Equipment Middle East – in Dubai. He has also initiated the opening of a service branch in the Eastern Province of Saudi Arabia, covering the market in the kingdom as well as Bahrain. Terex Equipment Middle East houses teams from both the Genie brand (which offers aerial work platforms), and the cranes business, and Von des Geest has doubled the sales force at the Dubai office since he took on his current position. The regional office is staffed by specialised and experienced crane service technicians and support staff, who are regularly updated regarding product developments and enhancements through training sessions and factory visits. The company also offers training to the operators of cranes employed by its clients. The regional office supports the current portfolio of larger Demag all-terrain cranes and Demag crawler cranes, as well as its legacy brands such as P & H and Lorain products. The Terex RT 90 features an enhanced control system with integrated diagnostics. 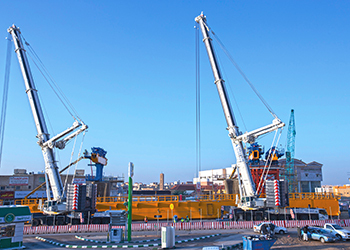 “The Gulf is unique as it has an interesting mix of extremely old machines as well as the latest generation cranes and also a mix between 35-tonne capacity cranes to 3,200 tonnes with our Demag CC 8800-1 Twin crawler crane. Our service technicians have wide experience in maintaining all types of cranes,” Von des Geest says. Terex Cranes enjoys a good reputation in the market with the Demag brand being a trendsetter in terms of developing new technology to ease lifting, optimise transportation costs and safety as well as being known for reliable machines. Von des Geest points out that safety is a key priority at the company. “At Terex Cranes, we strive for zero harm: think safe, work safe, home safe. It is essential for us, whether for our customers or Terex Cranes team members. We also develop features and products which enhance safety on jobsite. The IC-1 Plus control system provides real-time calculation of the lifting capacities and supports operators in safe crane operation. It also allows asymmetric outrigger positioning. This also allows the crane to perform jobs usually reserved for larger machines,” he emphasises. With the rental market for mobile cranes being particularly robust at the moment, Terex Cranes counts among its main clients some of the largest equipment rental firms in the region which are primarily service providers for the oil and gas, infrastructure construction and industrial sectors, among others. “Typically mobile cranes lend themselves to the rental market. The owners of these cranes are large rental companies serving projects in oil and gas, petrochemicals, road and bridge building, high-rise construction and other large infrastructural developments,” he adds. Cranes from Terex Cranes are currently engaged on some of the largest projects under way in the Gulf including the Riyadh Metro, the stadium projects in Qatar for the 2022 Football World Cup, the fourth refinery and airport in Kuwait, Bapco Refinery expansion in Bahrain, the nuclear power plant in Abu Dhabi and the Expo 2020 site and The Hills residential project in Dubai. The Riyadh Metro and nuclear power plant are examples of some of the prestigious projects where the contractors have purchased – as well as leased – its cranes. As part of its growth plans for the region, Terex Cranes is looking at setting up another branch office in the Gulf and further expanding its local presence by recruiting new staff. “With the growing population of Terex and Demag machines in the region and also the increasing demand, we are looking at improving our aftersales support by being closer to our customers, for example in Qatar and Kuwait,” he says.